When you're in the heart of central London, it can be hard to imagine that by travelling as little as 25 miles out of the city, you can find yourself in the beautiful countryside of the Surrey Hills. These gently rolling chalk hills were made an Area of Outstanding National Beauty over 50 years ago and are an ever-popular destination for day-trippers and holidaymakers alike. 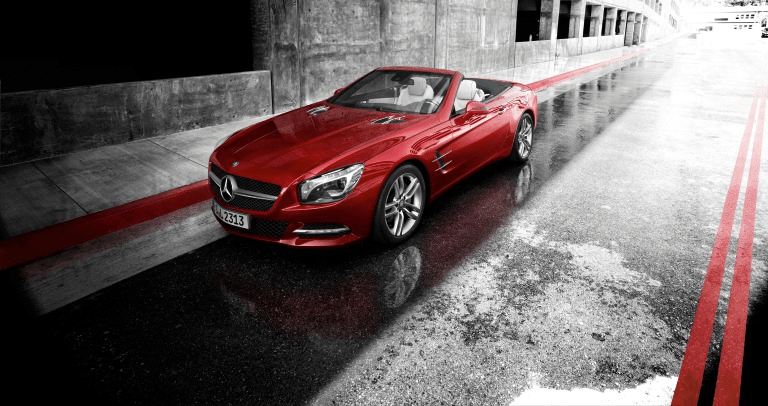 Ranging from winding country routes through quintessential British villages, to the major motorways, you'll find the area is the perfect place to head for if you're hiring a two-seater roadster like the Mercedes SL400 from any of our locations in London. Here are a few of the best routes to get your hired Mercedes' roof down and take in this beautiful part of Britain. Head out of London via the M25 Orbital Motorway, before turning off at Junction 11 into the village of Ottershaw and you can work your way through the heart of Surrey, taking in the tranquility of West Byfleet and Sheerwater en route. Crossing the River Wey, your first port of call should be the stunning Wisley Gardens. Run by the Royal Horticultural Society, it's the second most visited gardens in the country after Kew, and offers a variety of events and activities all year round on top of its serene scenery. Some of its grandest centerpieces are the large glasshouses which recreate environments from all around the world and display many rare orchids. Take the A3 southbound, which is more like a motorway at this point and perfect for putting the SL4000 through its paces, and you'll find Surrey's county town of Guildford. It's a great place to stop for a bite to eat and a stroll round the cobbled streets that are lined with historic buildings - it even has its own cathedral. Nearby Godalming is a quaint Surrey town, notable for being the first in the world to have had electric street lighting. To reach it you just take the A3100 through the countryside - the perfect opportunity to put the roof down and feel the wind in your hair as you head towards your destination. If it's a fine day you might even want to take to the River Wey on a punt or a rowing boat. Across the B3001 you'll find Farnham, a traditional old market town that boasts some of the finest Georgian architecture in the south of England. There's a parish church and a castle that dates back to the 12th century, as well as a museum where you can learn all about the town and its history. Farnham is also the starting point of the North Downs Way National Trail. Over 150 miles long in total, the whole trail runs as far as Dover on the Kent coast - and the section that passes through the Surrey Hills offers easy walking and some truly spectacular views. Last but not least, any trip to the Surrey Hills wouldn't be complete without a visit to probably the most famous one of all - Box Hill, the summit of the North Downs. It gets its name from the box woodlands on its west-facing slope and is partially owned and maintained by the National Trust. It's easily reached along the A25 and once you get there, be sure to look for Salomon's Memorial and viewpoint where, on a clear day, you can see for almost 30 miles. Take the B2033 for a woodland drive at the north of Box Hill - perfect for dropping the top on your Mercedes.